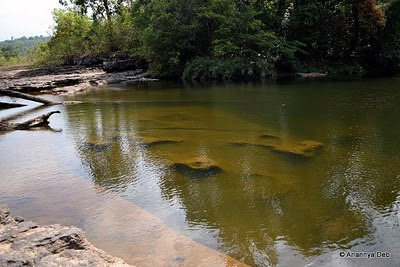 Phu Khao Khouay National Park: By visitmekong.com, by greendiscoverylaos.com. Phu Khao Khouay means "Buffalo Horn Mountain". Mountains, rivers and forests of this National Protected Area offer great opportunities for exploring the nature and inviting for trekking, canoeing, wildlife watching, picnicking and camping. 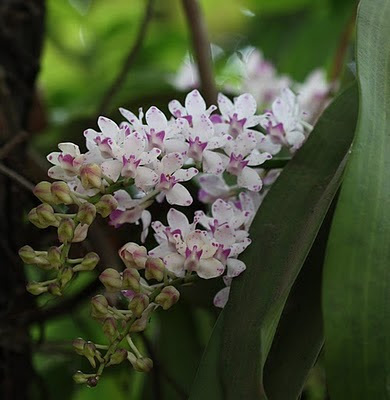 There ist also a very interesting Phu Khao Khouay National Park Facebook Page. The village Ban Na for example is famous for watching wild Elephants. 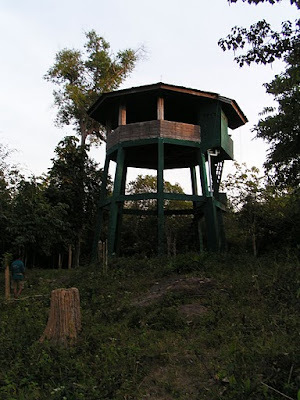 For that you spend a night at the Elephant Observation tower. Read more about Ban Na. If you want to go on your own: Pick-ups from the southern bus station in Vientiane leave[ from 9a.m & 5p.m every 30minutes. Families in Ban Na offer homestays. If you go on your own call Mr. Bounthanom (phone 020 220 82 86). The village Ban Hathkai is starting point for trekking tours into the mountains or to the twin waterfalls Tad Xay and Pha Xay. The area is also rewarding for its orchids,ferns and flowering plants (see great pictures by Art Vogel. Most trips include a boat trip on the Nam Mang River. Ban Hatkhai can also be reached by boat from Thabok (in just over an hour). You go there there negotiate for the price. Families in Ban Hathkai offer homestays. Call phone 020 224 03 03 and get an impression by this photogallery. Read more about Ban Hathkai. Tad Leuk is a waterfall within the Nam Leuk, The Tad Leuk Visitor Information Centre offers an exhibition of the flora and fauna of the area, informations in Lao as well as English and with a small library with reports aboit the regional plants and wildlife. It's starting point of the "Houey Bone Nature Trail" (1.5 kilometres). A small restaurant offers Lao meals and a guidebooklet for the trail. And you can walk in two to three hours to Tad Xang waterfall. Read more about Tad Leuk. 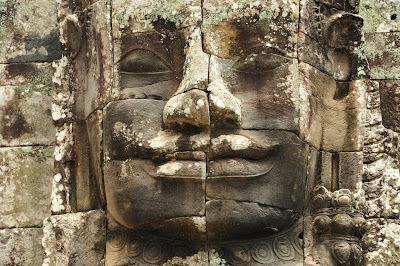 See pictures of Nam Leuk by Harald Borges.